Height 5 ft 51/4 in. Weight 133 lb. Chest 33-36 inches. Complexion dark. Eyes brown. Hair black. Sight, hearing - good. Colour-vision correct. Limbs, chest well formed. Full movement of limbs. Heart, lungs - normal. Teeth - fair. Free from hernia, variocele, varicose veins, haemorrhoids, inveterate or contagious skin disease. No vaccination mark. Good bodily & mental health; no physical defects. D.S.O. - presented January 1918, for bravery in the field. Son of Joseph Samuel & Kathleen Agatha HOPKINS, of Waihimomona, Geraldine. Attended several schools in Christchurch. 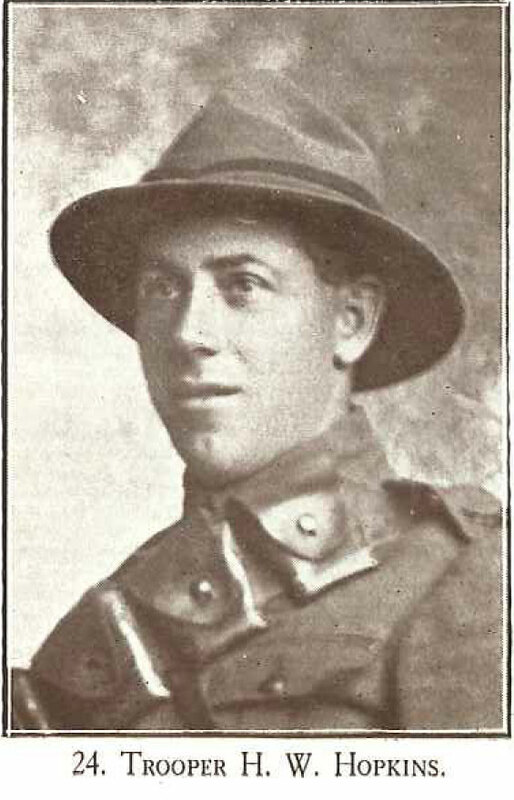 Brother Leslie Garey HOPKINS was killed in action in 1917.